Nathaniel Leonard is one of the most important Missouri pioneer settlers who improved livestock of all kinds. Mr. Leonard is perhaps best known for breeding Shorthorn cattle, but he was responsible for bringing the first imported jacks to the state of Missouri. The jacks were imported from the island of Malta in the spring of 1838. Leonard paid $800 for a brown jack in early 1839. This jack had been imported from Malta and then selected in New Orleans by David Workman and Philip Thompson of New Franklin, MO. By March 1840, Leonard had paid $818 in full for the jack. After they selected the jacks, they were probably shipped by boat up the Mississippi and Missouri Rivers to New Franklin. Nathaniel Leonard became one of the leading breeders in jackstock. Col. Louis M. Monsees of Smithton, Pettis County, was considered to be the king of jackstock breeders in the United States. In March 1905, Mr. Monsees sold a number of jacks and jennets that averaged more than any other sale in the country at that time. At the St. Louis Worlds Fair in 1904 the Monsees collection of jacks and jennets made a brilliant record. They won fourteen gold medals and diplomas. They also won the greatest amount of cash won that was won by any other exhibitor of livestock of any category. Mr. Monsees held the undisputed rank as the foremost breeder of jackstock in the country. Mr. Monsees achieved his great reputation as a constructive breeder through the use of two beautiful sires - Limestone Mammoth and Orphan Boy. Orphan Boy had a remarkable career as a show animal in the hands of Mr. Monsees. He was never defeated in the show-ring, and was also a great breeding jack on mares and jennets. 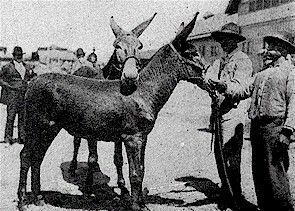 Monsees praised the merits of mules about 1917, predicting that "There are too many countries and places where the tractors or other motors cannot fill the place of the mule.... as the mule is the best of all working animals." He also wrote, "The mule is by far the best and cheapest to operate large farms with, especially sugar and cotton plantations, where horse power is used...... mules can be unharnessed when the day's work is over, turned in this corral or lot where there is a tank full of water, a trough full of grain and rack full of hay without any danger whatever of a mule over-eating or over-drinking himself, or of having colic or getting foundered, etc., and there is no danger of these mules kicking and hurting one another. The mule is too smart to over-drink or over-eat, or to be hurt by another mule." J. W. Givens of Fayette, Missouri, had also been one of the leading breeders in the state. His career in breeding was marked by more than ordinary success. He bought what he considered, the best jack in the world, Legal Tender. Legal Tender had won several championships and grand championships and did not go undefeated during his show career. References - Ashton, John. 1924. History of Jack Stock and Mules in Missouri. Missouri State Board of Agriculture. Volume XXII, Number VIII. 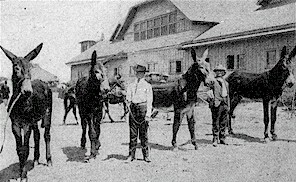 Horses and Mules, 1917. Missouri State Board of Agriculture. Jefferson City, MO. This page was designed by Cara Borneman.